Unfolding at a measured andante, this first feature from Israeli director Eran Kolirin is a small, humanist film that wisely resists pronouncements about Arab-Israeli relations and heavy-handed political allegory. 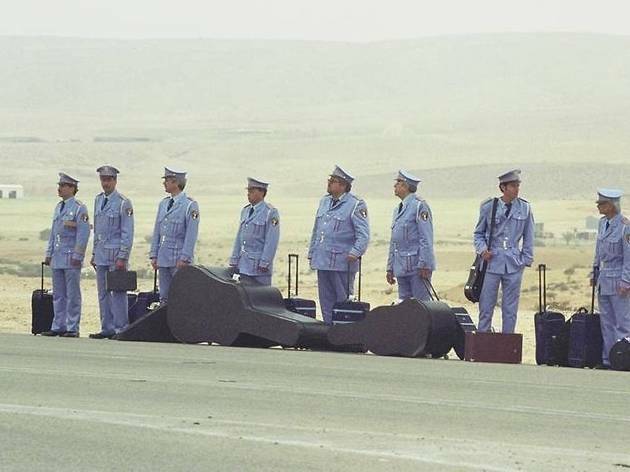 The Alexandria Ceremonial Police Orchestra has flown from Egypt to play at the dedication of an Arab Cultural Center in Israel, but no one shows to greet them at the airport. They’re left standing, stiff and uncertain, in their dress blues. 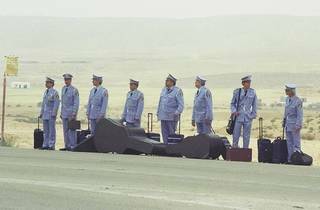 (That the uniforms are powder blue, seemingly issued in the 1970s, is just one of the many understated comic touches in The Band’s Visit.) The mustachioed conductor, Tewfiq (Gabai), greets this dilemma with a practiced and weary dignity; he dispatches Khaled (Bakri), the group’s smooth young lothario, to scout for ground transportation. But Khaled is more interested in flirting with the woman at the bus kiosk, and the orchestra finds itself dropped at the wrong destination—a ghost town in the desert. What happens to them there, and the gentle misunderstandings with layabout locals, makes for a slender plot. But The Band’s Visit runs on tone—one that skirts cuteness but ultimately reveals the film’s melancholy soul. The performances are wonderful, especially those of Gabai and Ronit Elkabetz, as the earthy proprietress of a roadside restaurant who courts Tewfiq with an amused sexiness.